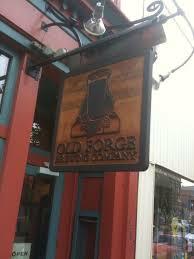 After signing out of our Bloomsburg hotel Saturday morn (April ’11), my wife and I ventured ten miles west to downtown Danville, spending an hour at OLD FORGE BREWING (opened for business December 5th, 2008). Described as a ‘fun, casual, comfy pub,’ this narrow bi-level saloon benefited from local farm-grown ingredients integrating brewer Damien Malfara’s healthy pub fare. Bending stylistic guidelines in his favor, the former Philadelphia chemist showed off an expressive array of suds emanating from downstairs fermenting tanks. Upon entering, a small silver brewing system fronts this brick-walled pink lady-like structure. Eight seats crowd the left bar (with colorful parasol, uniquely carved tap handles, and pottery-made beer mugs) situated across three right side tables and antique oaken-framed mirror. Handcrafted wood and metal fixtures bedecked this ground level space. The similarly styled upstairs lounge backed up against an outside deck colorfully splashed with Old Forge insignias and the like. A short menu included burgers, sandwiches, and quesadillas. Old Blues music played as I inspected my seven sturdy samples. On the moderate end, mildly bitter smoothie, Egan’s Best Bitter, draped caramelized fig across apricot-dried fungi bottom. Perched between the brewers’ Bellows Brown Ale and Underbite IPA, Falling Down India Brown opposed leafy dry-hopped tranquility with brown-sugared caramel-chocolate malting. Light-bodied Kolsch, Endless Summer Ale, spice-hopped lemon-rotted citric fizzing. Lager-aged, mocha-dried, fig-sugared, prune-strewn Old Forge Alt nearly outdid superb orange-peeled, lemon-limed, juniper-embittered T-Rail Pale Ale (deviously replicating an IPA). Candi-sugared Slightly Rood Belgian Pale Ale countered biscuit-y caramel toasting, dried fig spicing, and date nut breading with clay-hopped bounty. Slack Tub Stout fused dry espresso, dark chocolate, and molasses to flaked oatmeal.